Leroy and Max have been ghosted. FOX has cancelled its Ghosted TV show. There will be no second season of the interrupted series, which took a long, awkward hiatus and switched showrunners part-way through its freshman outing. 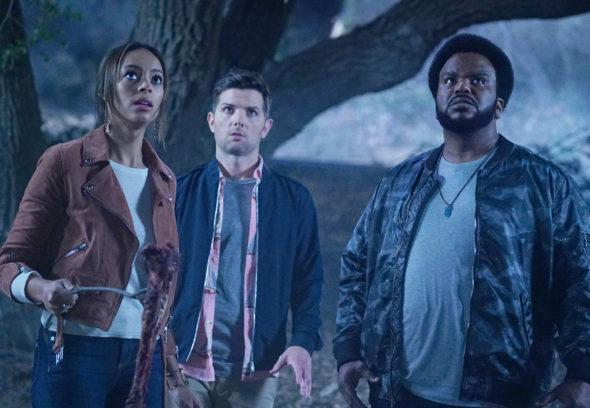 A FOX horror comedy, Ghosted stars Craig Robinson, Adam Scott, Ally Walker, Adeel Akhtar, and Amber Stevens West. It centers on ex-LAPD detective and current mall security guard, Leroy Wright (Robinson), and former Stanford astrophysics professor and current bookstore clerk, Max Jennifer (Scott). Leroy and Max end up working for a secret governmental agency known as the Bureau Underground, to save the world from all kinds of unusual threats including cryptids, extraterrestrials, and the paranormal. The first season of Ghosted is averaging a 0.94 rating in the 18-49 demographic and 2.398 million viewers. Find out how Ghosted stacks up against the other FOX TV shows. It’s official: Fox will have a clean live-action comedy slate next season with no returning series. The network has formally canceled Ghosted, its last remaining series that was still awaiting word on renewal. Ghosted‘s cancellation had been considered a foregone conclusion but Fox postponed the decision until after the comedy returned for the remainder of its freshman season earlier this month. With the options on the cast expiring this coming weekend, the network was prompted to act. Ghosted joins the other cancelled FOX live-action sitcoms, The Last Man on Earth, LA to Vegas, and The Mick, as well as New Girl, which ended. Only Brooklyn Nine-Nine was rescued from its FOX cancellation, when NBC picked it up for a sixth season. What do you think? Did you watch the Ghosted TV series? If it had been up to you, would Ghosted have been cancelled or renewed for season two on FOX? Ghosted: Is the FOX TV Series Cancelled or Renewed for Season Two? Super rediculous !!!! All about keeping up with other stations i guess.gotta compete. Gonna replace this fun show with stupidity like another hospital drama or another lets date on tv for 6 weeks and get married competiton show. Im done with FOX !!!! Canceling all the good stuff for straight up DRAMA !!! dont they realize the more good shows they cancel, the more people are going to watch other stations and the more shows they will have to cancel because no ones watching the station ??? I loved this show! and The Mick, Last Man on Earth, and LA to Vegas. I have nothing left to watch. Guess I have to go and get a life now. FOX I despise you! I loved the show. It figures it would be cancelled.